West 23rd Street near Madison Square was a most fashionable residential street in 1870. Here at No. 12 the wealthy stockbroker Benjamin Nathan lived. Next door at No. 14 was the Jones mansion where little Edith Newbold Jones was growing up. The girl would become famous as Edith Wharton. The munificent Benjamin Nathan spread his fortune around. The New York Times would later say “No man was more unselfish, more generous in charity than he and none worked more indefatigably in all good works.” He had donated half a million dollars to various charities. He did not, however, deprive himself or his family of luxuries. 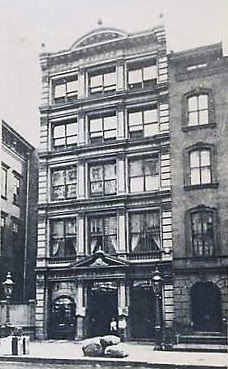 The 23rd Street house was, according to The Times, “lavish to excess.” The newspaper described it as “one of the most elegant and spacious of the private residences of the City.” The four-story house was home to his wife, Emily, and their seven children. In the English basement were the kitchen and laundries; the dining room, butler’s pantries parlor and “spacious halls” were on the first floor while on the third and fourth floor were family bedrooms. On the second floor was Nathan’s office, a reception room, bathrooms and a housekeeper’s room. Unlike many Jewish New Yorkers at the time, Benjamin Nathan was welcomed into the main stream of wealthy society – he was a member of the St. Nicholas Society, which rarely accepted members not of Dutch ancestry, and the exclusive Union Club. In the Spring, Nathan had rented a 45-acre country estate in Morristown, New Jersey. The family was summering there, enjoying the private vineyards and gardens and rural breezes. On July 28 Benjamin and his two grown sons, Washington, 22, and Frederick, 26, traveled back to the city. The following morning prayers would be said for Benjamin’s mother at the Shearith Israel synagogue on the first-year anniversary of her death. That night of July 28 was dark and stormy. Benjamin visited his sister with his sons, then went home alone in the rain. The brothers went their separate ways into the night. Because renovations were being done upstairs, a make-shift bedroom was thrown together for the 56-year old broker in the second floor reception room. He undressed and went to bed wearing a long nightshirt. Nearby were his clothes, piled on a chair. Three large diamond studs were on the shirt and a heavy gold pocket watch and chain were in a pocket. In his trousers was the key to the safe in his adjoining office. On the same floor Ann Kelly, the housekeeper, was sleeping while her son, who was also employed as a servant, had retired to the garret. Frederick came home shortly after midnight, checked in with his father who was still awake then went upstairs. At 12:20 Washington came home, having visited a brothel. His father’s door was opened, but the man was asleep by now, so he proceeded up the stairs. Outside, Patrolman John Mangum walked his beat. He passed by the house at 1:30 and tested the door – it was locked. At 4:30 he passed again, and again the door was secure. All seemed quiet and at peace inside No. 12 West 23rd Street. Frederick rose at 5:45 the following morning and, still in his nightshirt and socks, heard his brother’s screams for help from the second floor. He ran to his father’s room and there on a blood-soaked carpet lay his father’s body, bludgeoned beyond recognition. “When I stepped up to his body I felt my stocking grow cold as the blood came upon them,” he told investigators. Nine brutal gashes had crushed Nathan’s skull. One hand was broken as testament to a mighty struggle. The diamond studs and gold watch were gone and the safe was open, papers spilling onto the office floor. Frederick rushed out the front door and cried “MURDER!” from the stoop. Seconds later his brother in his blood soaked nightshirt followed. The case was puzzling at best. That Benjamin Nathan could have been brutally murdered and not one of the four persons sleeping in the house heard a noise was baffling. The street doors were all tightly locked, as Patrolman Magnum repeatedly testified. And why was the murder so vicious if the motive was simply burglary? Jourdan was flooded with letters offering leads. Hundreds of tips came in. Some people had revelations in their dreams. A Brooklyn psychic offered help. Suspicious persons were seen as far away as Wisconsin. And several citizens pointed the finger at Washington Nathan. The New York Stock Exchange offered a reward of $10,000 for the arrest and conviction of the murderer or murderers. 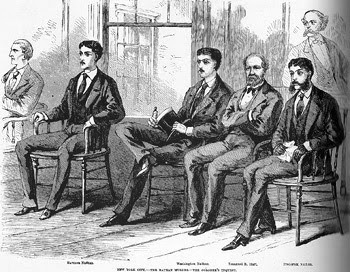 Emily G. Nathan offered more than $30,000 for information pertinent to the case. But nothing was forthcoming. Jourdan wrestled with other problems in the case. The murder weapon disappeared from the police station. A bundle of clothing was reportedly spirited from the house on the afternoon after the murder; yet the laundress who took the bundle would not speak to police. The bloody carpet was sent to be cleaned the same day. The stress of the case took its toll on the superintendent. Police Captain George Washington Walling, in his book "Recollections of a New York Chief of Police," later recalled "From the day of Nathan's death, Jourdan failed. He never made a step in advance, and died a few months afterwards." The family moved out of No. 12 and into a grand Fifth Avenue mansion. The 23rd Street house sat empty for years—no one would buy or rent in the murder home. Washington Nathan continued with what the New York Times called the “wild course from which his father’s pleadings could not turn him.” Captain Walling would later recount "His liaisons became public and disgraceful." He continued his drinking and gambling and whoring. When he ran out of money, he lived off Fanny Barrett. However when he came into some money of his own and did not need her anymore he picked up with an actress, Alice Harrison. Fanny had the last say by shooting Washington in the jaw when he went to the Coleman House to pay his new sweetheart a visit. The bullet was never removed. Emily Nathan died in 1879. From her $1 million estate, Washington received $100,000. In addition he received $75,000 from his father’s estate, $25,000 from his grandmother and another $10,000 from an aunt. By 1884 he was spent it all. The murder of Benjamin Nathan in the upstairs room at No. 12 West 23rd Street would never be solved. As the turn of the century approached, West 23rd Street was no longer the fashionable residential street that the millionaire broker would have remembered. The Jones house had been renovated to commercial use with a cast iron façade being screwed over it, as had the Nathan house. In the 1890s Henry Plant’s Southern Express Company had its offices here. The United States Trust Company announced that it would raze the converted mansion to erect a “modern business building on the site.” The firm changed its mind, however, almost immediately leasing the building to Solomon Tim. A series of powerful gas explosions on the morning of March 8, 1914 nearly destroyed the building. The blasts, centered at 23rd Street where Fifth Avenue and Broadway intersect, broke water mains, blew out scores of windows and flooded the subway to a depth of ten feet. While the ground floor of No. 12 was essentially unscathed, “the wreckage in the three upper floors was practically complete,” as The Times reported. Like the Edith Wharton house next door (now housing a Starbucks), Benjamin Nathan's once-grand mansion is unrecognizable under heavy commercial renovations. A fifth floor was added to the structure sometime after this. Today the street level houses a Mexican restaurant while small businesses occupy the upper floors. The cast iron façade of the upper three floors is rusting and neglected and no one passing by No. 12 West 23rd Street would suspect that it is the scene of one of New York City’s most notorious murder cases.